Company for Critical Mass. In Santiago, Chile, where the surrounding Andes trap smog like steam in a Turkish bath, hundreds of people hop on their bicycles once a month to make a pitch for more bike lanes and to fight air pollution. The August 16 Christian Science Monitor suggests that the Ciclistas Furiosos seem pretty reasonable after some of the other environmentally friendly proposals that have floated through the city: "There was the suggestion to have planes dump water on the capital to simulate rain. Pinochet even rallied to cut a hole in the Andes mountains that encircle the city." Cueing up. The folks at UC Berkeley sure know how to throw a bash. 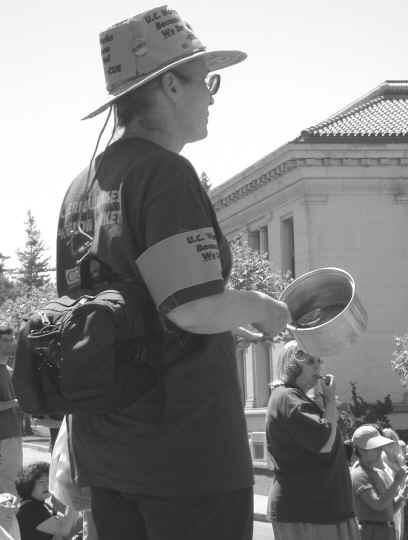 Every Wednesday at noon, a group of about 75 clerical workers and friends gather outside California Hall, where Chancellor Robert M. Berdahl hangs his hat. Despite the festive air, this is not a social occasion. These men and women, mainly members of the Coalition of University Employees, have been congregating on the same spot every week since June. They take a winding route through the campus — one week to University Hall, another week to Faculty Glade, beating on an assortment of kitchen utensils like cast members in a revival of "Stomp." One energetic marcher has managed to smash a gaping jagged hole in the middle of her aluminum cake pan. But the wonderful din is not all musical comedy. Among the navy blue T-shirts that read "I work for free on Friday," a few chartreuse T-shirts stand out: these are the hunger strikers, the people who have vowed to fast at varying intervals until the university agrees to pay what they consider a fair wage. CUE claims that the market rate for comparable jobs is 21 percent higher than what these employees receive, and adds that present salaries haven’t even kept up with the cost of living. The university has countered with a proposed 2 percent increase, a rankling figure in light of recent large raises to high-level administrators and faculty members. Contract negotiations have been continuous for two years, ever since CUE became the union of choice for the university’s 18,000 clerical workers statewide. News from the neighborhoods. Our Mayor has got the city’s homeless situation figured out — it’s ’cuz we’re too nice. His monthly column in the latest San Francisco Downtown runs a detour around our city’s skyrocketing housing costs to lay the blame on our own hospitable natures: "Over the years, countless people have come here seeking refuge in our reputation for tolerance. As the rest of the country has reduced investments in social services and institutional care, a number of people profoundly alienated from society have gravitated to San Francisco." <> Victor Miller, writing in the August New Mission News, casts a nay vote for district elections: "Tom Ammiano, unless he is caught in bed with a live woman or a dead man, will be the supervisor from District 9, which includes nearly all of the Mission. As nice as it will be to be represented by a person of such decency and integrity, it will also mean that the neighborhood will be considered enemy territory by a grudgy Willie Brown, still irked by Ammiano’s upstart campaign for mayor last year." <> The July Sunset Beacon detects Our Mayor’s fine Italian hand in a recent Planning Department proposal to impose stricter building controls on the Inner Sunset. Contributor Carol Dimmick notes that "tougher controls take a potentially hot item off the table during upcoming district elections — one that has the potential to spur disgruntled residents into electing a maverick supervisor."